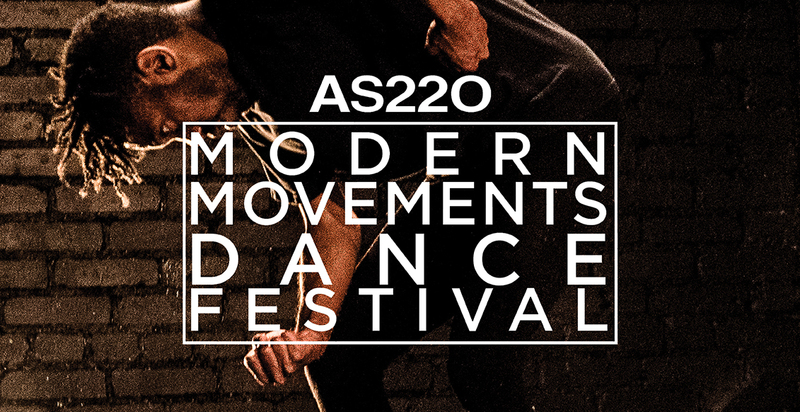 AS220 presents the second annual Modern Movements Dance Festival from April 1st through 23rd at the AS220 Black Box Theatre (95 Empire Street, Providence), featuring seven dance artists and companies that celebrate the creativity, ingenuity, and experimentation of modern dance. AS220 supports the creation of original work across a range of disciplines. In keeping with this commitment, the Modern Movements Dance Festival recognizes dancers as makers: interdisciplinary artists that collaborate with choreographers; artists; musicians – along with lighting, sound and visual technicians – to make new work that pushes boundaries and expands our understanding of dance. Hours: Open one hour before all festival performances, Saturdays 12 – 5 PM, and by appointment. featuring artists from the AS220 Modern Movements Dance Festival, moderated by Mellon Post-Doctoral Fellow at Brown University, Sarah Wilbur. The Light Show, a new work by The Low Mountain Top Collective is an exploration of narratives surrounding what it means to be alive and wounded, to exist in shadow and light, to move from a place that is a merger of the personal,political and spiritual. Our investigations will take us from infra red beginnings, through the visible spectrum of light to ultra violet light and beyond. As we journey through these waves of light we carry with us our stories full of life, and full of wounds. The prime questions of our journey are what roles do our wounds play in our physical and meta-physical transformation? For the third consecutive year, dance icon Bill Evans will celebrate his birthday by doing what he loves most at the AS220 Black Box Theatre. He will be joined by tap artists Kristen Socci and Courtney World, and jazz pianist Greg Woodsbie, all of whom performed with him at AS220 last April. Also, Mark Yonally, one of the rising tap stars on the world stage, and a former Evans student and company member, will be dancing with him again for the first time in a decade. The entertaining and thought-provoking program will include choreographed and improvised rhythm tap works, both reconstructed classics created by the African American masters who originated this art form and new cutting-edge works by Evans and Yonally that are moving tap forward through fusion with theatre and other dance styles. As the anchor performance of their second season, Doppelgänger Dance Collective will present new interdisciplinary works at AS220s 95 Empire Black Box in April 2017 as part of their Community Live Arts Residency. DDC will premiere a dance film, directed by Andy Russ in collaboration with poet Laura Brown Lavoie, and students from the Jacqueline M Walsh School for the Arts, as well as two new works by Rhode Island-based choreographer Heidi Henderson and a piece by Boston-based choreographer Alissa Cardone. Walk the (pink) Elephant, Denizen Arts (Yon Tande + Jude Sandy), is an exploration of absence and a ritual of reckoning and regeneration in the face of cataclysmic loss. It memorializes and opens ground in the wake of multiple generations of (often queer) artists of color decimated by HIV/AIDS due to lack of resources (health, familial, social and others). Instructions for the Safe Delivery of the Royal Knee, Orlando Hernandez, continues a series of performances developed through tap dance and text, exploring and complicating Spanish and US histories, and histories of the Caribbean diaspora, with the belief that percussive dance can help generate environments of resistance against persistent colonialism and racial violence. This piece draws mainly from two texts, El Requerimiento, a legal and religious contract that Spaniards were required to read to native peoples before attacking them, and The Indian Militia, by Captain Bernardo de Vargas Machuca, an anti-guerilla warfare manual written to help Spanish generals in their wars against Indians. In Kaliede, Amorphous Dance Collective, delves into concepts of weakness and strength. Inspired by natural sounds, images, and spoken-words, each dancer constructs a personal vignette that becomes woven into a larger narrative of potency and vulnerability. Created in a spirit of true collaboration, Kaliedes dancers are also its creators. The dancers have varying backgrounds of technique, composition, and movement experience, which they draw from throughout the creative process. Under the Shiny is the latest collaboration between Ali Kenner Brodsky and Andy Russ. Incorporating the work of ceramic artist Anna Highsmith, the piece is a playful dance-theater duet that may or may not know where it is going.